Catano is a municipality located on northern coast of Puerto Rico bordering the Atlantic Ocean and adjacent to the north and east by San Juan; north of Bayamon and Guaynabo; east of Toa Baja and west of Guaynabo and is part of the San Juan Metropolitan Area. Catano is spread over 7 wards and Catano Pueblo (The downtown area and the administrative center of the city). It is part of the San Juan-Caguas-Guaynabo Metropolitan Statistical Area. Hernando de Catano was chosen to offer his medical services in Puerto Rico during Francisco Bahamonde de Lugos tenure as Governor of Puerto Rico (1564–1568). He was one of the first physicians that arrived at Puerto Rico during its colonization and, upon accepting his position, received as payment a piece of land across the San Juan islet. From that time, the region started to be recognized by the name of its original owner. As people started establishing in the area, Catano was declared as a barrio of Bayamon. However, there wasnt much success in the towns development during this years due to its swamp-like terrain. Still, around 1690, a hermitage was established to allow residents to receive religious services without having to travel to Bayamon. In the middle of the 19th century, a transport company was founded to facilitate the transportation of merchandise and passengers through the San Juan Bay. This spurted a growth in the population of Catano, transforming it into one of the most prosperous barrios of Bayamon. Still, attempts to separate themselves from Bayamon on 1839 were unsuccessful. On June 26, 1893, Bishop Antonio Puig y Montserrat separated the barrios of Catano, Palo Seco, and Palmas from Bayamons parish and established an independent parish for the residents of these sectors. In 1927, Catano was officially declared a municipality with the name "Hato de Palmas de Catano", which was simply shortened to Catano. Politics also played a crucial part in the foundation of the town, since Bayamon was controlled by an administration with opposing ideologies to those of the islands Legislature. The separation of Catano from Bayamon was a strategy to weaken that opposition. With only five square miles of territory (12.5 km2), Catano is the smallest municipality in Puerto Rico. It is less than half the size of Hormigueros, the next-smallest in area. Catano consists mostly of flat plains that belong to the Northern region of Puerto Rico. Its northern shore falls on the San Juan Bay of the Atlantic Ocean. One of the main tourist attractions in Catano is the boardwalk or "Tablado" that commands a view of the San Juan Bay, including views of Fort San Felipe del Morro on the opposing side. 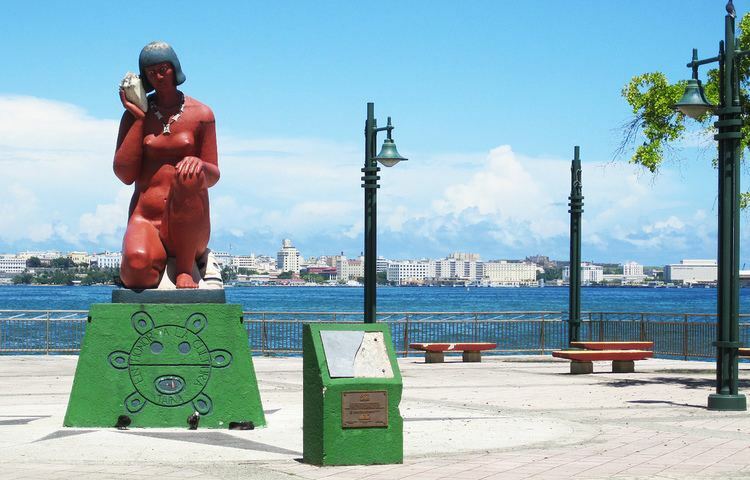 There are several monuments and sculptures along the boardwalk, including a monument to taino culture called "India Taina". The Bacardi Distillery also offers tours of its facilities to visitors that want to see and learn about the rum manufacturing industry in the island and the Caribbean. The town gained notoriety in 1998, when Mayor Edwin Rivera Sierra traveled to Russia and acquired a huge statue of Christopher Columbus called "Birth of the New World". The statue Columbus by Tsereteli was designed by artist Zurab Tsereteli and would measure 350 feet (110 m) when erected. Tsereteli had offered the statue to the United States as a gift in 1992 with the intention to use it for the celebrations of the 500th year of its voyage. However, the United States rejected it. The transportation of the statue from Russia to Catano cost $2.4 million. After arriving at the island, the 2,700 bronze pieces of the statue were scattered in a terrain awaiting for funds for the project, but Rivera Sierra was unable to garner enough public support and funding for it. Allegedly, theres an agreement to erect the statue in the city of Mayaguez instead, for the celebration of the 2010 Central American and Caribbean Games. Due to its location, Catano has always played an important role as a port to the island. Fishing has also been a main source of economy for centuries. Bacardi, one of the largest rum manufacturers of the world, has a distillery in Catano.